With increasing competition in the Higher Education Industry and an era digital technology at one’s choice and disposal, it’s difficult to connect with prospective students make a true impact on their minds. It is important to understand that Just reaching out to potential students is not enough, but the institute has to “engage” with them throughout the student journey by being proactive on the digital media front. 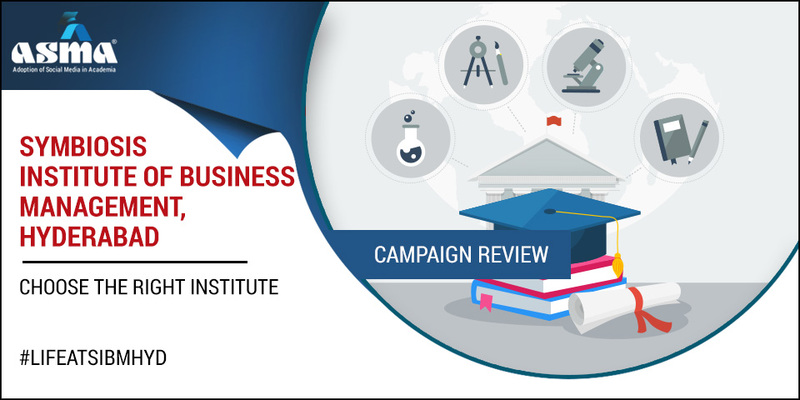 The campaign run by SIBM-H has a successive impact on the overall engagement rate. To promote unique and innovative learning methods at SIBM. To build an institution brand and increase the number of potential aspirants. To promote cultural diversity at Institution and build long term relationship with the audience. Promoted the integrity of SIBM-H campus culture on social media. Shared short video stories to convey reasons to choose SIBM-H. Collect Testimonial of Corporate Heads and Top-level management to display corporate relationships process and structure at SIBM. It is vital to understand the need for digital media to reach out to the potential audience. In the stipe competition, the Institution needs to put forward differentiating factors to stand out of competitors. The diversified approach has been taken to tell reasons to choose SIBH-H, with increase industry participation to attract the audience. The approach was straight and simple to reach out audience over Twitter, Facebook, Instagram, and YouTube. The short video stories have been sponsored on YouTube, engaging the audience to visualize the campus life at SIBM-H. The content plays a very important role in the success of a campaign. It might a case where your graphics and visualization are at best but still not able to generate the required lead. The reasons for such failure are content and its placement. SIBM-H has been able to share qualitative content over social media, engaging the audience in Q&A strategy. The reasons to choose SIBM-H have been placed in each post on social media. Post related to a vibrant residential campus facility. Facebook is used to engage the potential audience as the majority of aspirants prefer Facebook as the most prominent social media platform to know more about institution. YouTube has been selected to share a testimonial of faculty, students and institution promotional content. The overall engagement on videos was good. Faculty Testimonial: To address the importance of diversified and technical learnings for MBA students. Student Testimonial: To share the experience at SIBM-H and how these learnings help them to grow 360 degrees. Instagram used to follow cross promotion and posts are related to rich faculty’s industry experience.